Steiner Ranch Neighborhood Association worked with TxDOT to provide input for the following project. If you have comments or concerns, please let us know. Just fill out the “Contact Us” form on this page. This update was also submitted to Steiner Ranch Post (June 2016) and the Four Points News (covered in May 2016). The intersection of Steiner Ranch Blvd. and RM 620 is due for a safety improvement with the addition of a full service traffic light according to TXDoT and Travis County. With the development of the business park adjacent to the intersection, and the continued growth of traffic volume transiting the intersection on RM 620, it became apparent that safety and efficiency considerations necessitated the installation of controls. A dedicated left turn lane and signal from RM 620 into Steiner Ranch Blvd. A signal controlled left turn out of Steiner Ranch Blvd. onto southbound RM 620. Concrete dividers prohibiting left turns into or out of the new dedicated business park entrance north of the intersection onto RM 620. Coordinated signaling between the light at Commanche Trail and the new light at Steiner Ranch Blvd. This project will be completed in two phases. The initial phase of the intersection improvement will include signal enhancement and appropriate restriping. It will not include access to the new auxiliary lane on RM 620, nor the concrete dividers emplaced on RM 620. Those will be emplaced once the designs are finalized for other improvements on RM 620 related to the RM 620 / FM 2222 intersection bypass. This project mirrors projects originally proposed to TXDoT and Travis County by the Steiner Ranch Neighborhood Association in 2012, which focused on adding an additional lane for northbound RM 620 to alleviate the congestion of morning and afternoon rush traffic and the addition of the light at Steiner Ranch Blvd. which was one of the options proposed to address community safety concerns for those who needed to turn left into Steiner Ranch, given the limited sight distance for oncoming traffic. Before settling on the current proposal, other options were explored with Travis County and TxDOT. Specifically re-alignment of Steiner Ranch Boulevard with the existing Comanche Trail intersection or vice versa. SRNA first proposed either re-alignment or synchronized traffic signals back in June 2012 at a meeting with TxDOT. At that time we considered also the expansion of RM 620 to provide an additional lane of access for east bound FM 2222 traffic and other improvements. Thanks to continued work by TxDOT and Travis County, all of these options are currently part of the proposed improvements to our corridor. SRNA then focused on realignment of Steiner Ranch Blvd. as an alternative. 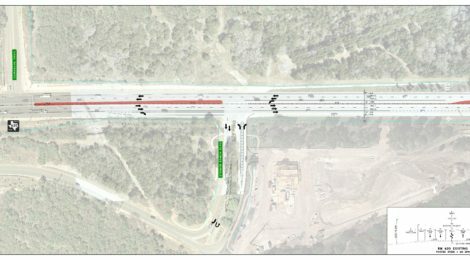 While this option presented multiple challenges we felt it was the safest and most practical option for traffic – which was agreed to by TxDOT. The first challenge with this option was that it crossed a small stretch of the BCCP. We did not want this to impeded doing the right thing since the environmental impact to BCCP could easily be offset, so we pursued this option with the county and eventually they agreed to do a study to evaluate this option. The result of the study showed feasibility but showed the cost for this re-alignment would be extremely high because of the grade changes and need to preserve access for large trucks, the outer bank of the road would need very significant re-enforcement and would be very costly, raising the projected cost to well over $5 million. Also, the outer bank of the road would intersect with a karst feature (shown in purple) in the diagram below, further complicating this optoin due to current BCCP status. After the re-alignment was effectively out of play due to costs and other complexities, SRNA asked the County if other options were available and the County continued to explore options for the intersection – engaging TxDOT and eventually settling on the current proposal – coming full circle to the idea of adding in synchronized traffic lights. We are thankful for the County and TxDOT for seeing this project through and addressing this important safety issue for the area including Steiner Ranch residents, businesses and visitors. Updated by request to include some background information on alternatives and why this option was selected.